There are three sources of genoa power: angle of attack, sail depth, and twist. Our goal is first to get the correct total power and, second, to achieve the correct mix of power from each source to suit the conditions. Trim the sail in, and you increase power by increasing the angle of attack. Ease the sail out and you reduce power. Once the sail is sheeted in, then the primary control of angle of attack is the helm. Bear off to add power, and head up to reduce power. Deep sails generate more power, while flat sail shapes generate less power (and less drag). Genoa depth can be adjusted through a variety of controls, including headstay sag, lead position, and sheet trim. A closed leech generates more power. A twisted or open leech spills power. Genoa twist is controlled through lead position and sheet trim. Halyard: Set the halyard to hold the shape of the sail in its designed position. Tension the halyard to remove wrinkles from the luff. If the luff is stretched, ease the halyard. In light air, an over-tight halyard hurts performance. As the wind builds, increase halyard tension to keep the luff firm. When rolling up the sail after sailing in strong winds, ease the halyard to relieve luff tension. Genoa (or Jib) Sheet: Trimming the sheet adds power by increasing angle of attack and by reducing twist. Initially, the sheet’s primary impact is on angle of attack as it pulls in the sail. As the sail nears full trim, the sheet pulls the clew down (more than in), and the primary impact of trim is to reduce twist. As you trim in the jib, you will be able to point higher (sail closer to the wind) without luffing. When additional trim no longer improves pointing, the sheet is overtrimmed. Ease slightly to optimize jib sheet trim. Headstay Sag: The amount of sag in the headstay can be controlled with an adjustable backstay. A tighter headstay flattens the sail, while extra sag adds power. In light air, set the headstay just firm enough to keep it from flopping in chop. Add tension as the wind builds. In strong breeze tighten the headstay as much as you can. Genoa Leads: Moving the genoa lead fore and aft changes sheeting angle. As an initial setting, adjust the lead so the sail luffs along its entire height as you pinch up above close hauled. From this initial setting, the lead position can be fine-tuned to the conditions. You may want to move the lead forward to add shape to the foot of the sail, which will reduce twist and therefore increase power. This lead-forward shape is best for light air or choppy conditions. Moving the lead aft reduces power for better performance in stronger winds. An aft lead position flattens the foot of the jib by letting the clew rise. (Think of it like tightening the outhaul on the main.) 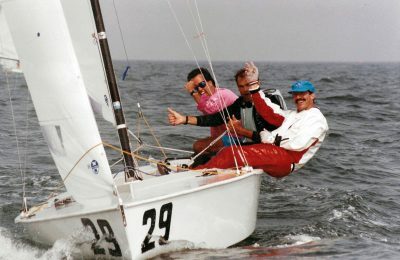 Moving the lead aft also increases twist, spilling power from the upper part of the sail. For heavy air sailing, we want the top of the sail to luff before the lower section. Leech Cord: The leech cord does not control sail shape. It is intended to prevent leech flutter, which can damage the leech of a jib. Tension the leech cord just enough to stop flutter, and no more. If your sail has a foot cord, the same principle applies. Do you need a genoa? Large overlapping genoas are difficult to handle, hard to tack, easy to damage, and impossible to see around. A smaller jib is much easier to handle. On boats with large mainsails, a genoa is an unnecessary burden. In all but the lightest conditions, a working jib provides comparable performance (hey, we’re not racing! ), and in moderate to heavy air the jib performs better.